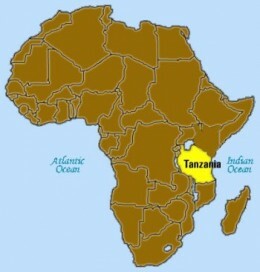 We have arrived safely back home from Tanzania. It’s been wonderful to see our families and friends and to celebrate our arrival in America. 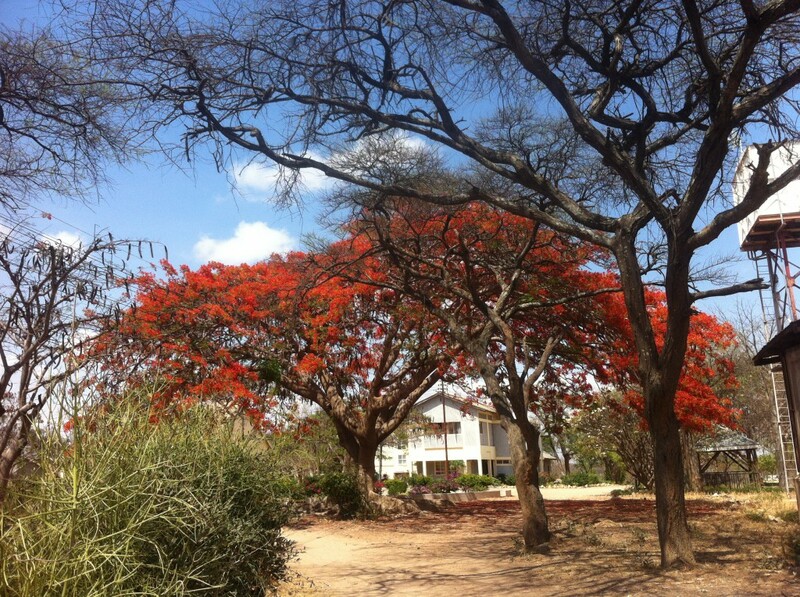 But Dodoma has become our second home, and there are many people and things we already miss. 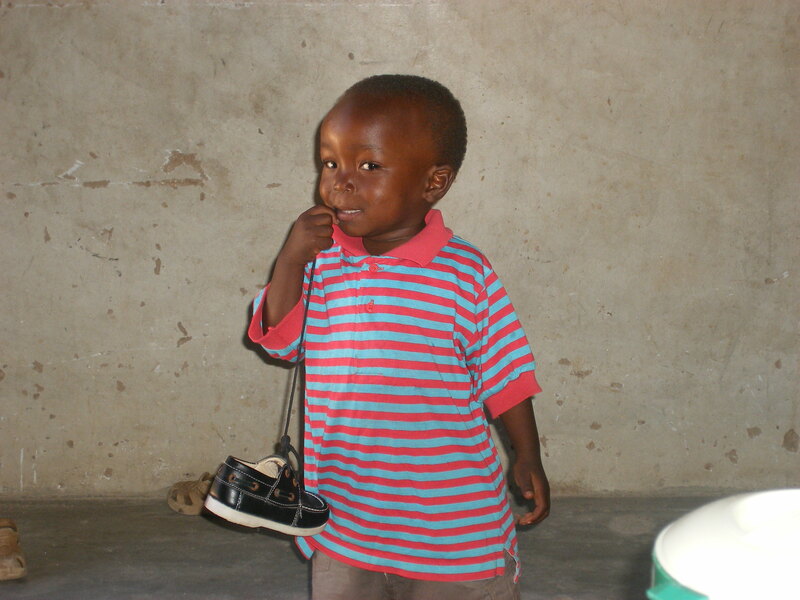 So we thought we would share with you the top 10 list of things we left behind in Dodoma, complete with photos! It was difficult to live in a country where most of the conversations we overheard were in a different language, but our love of Swahili definitely grew over the course of the year. 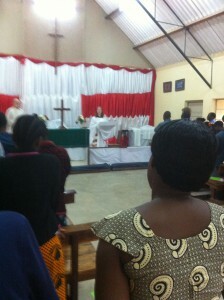 Elizabeth even preached twice in Swahili (to thunderous applause)! 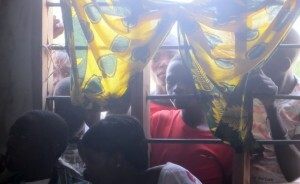 Many city blocks long, crowded, and busy, the Dodoma market was very intimidating at first. But by the time we left, we were able to navigate the market better than any Walmart, and we could even bargain in Swahili. 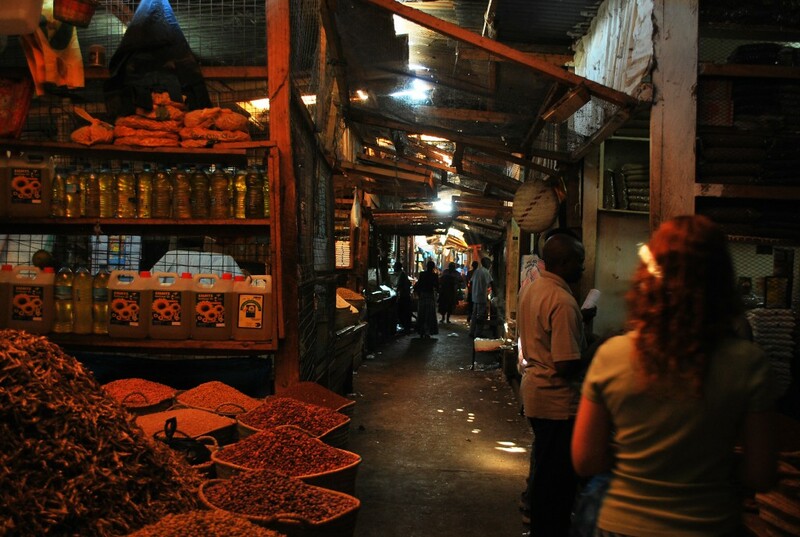 It was a great place for all sorts of fresh fruits, vegetables, meats, and spices. 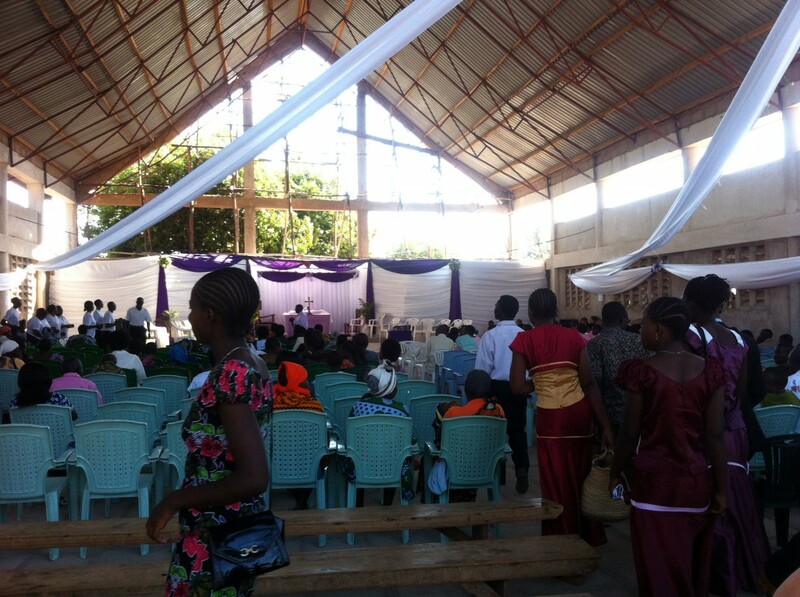 Ben’s Sunday church assignment was a great place to experience true Tanzanian church. 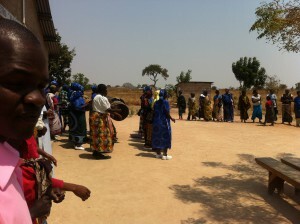 It featured an excellent Mama’s choir with singing in Chigogo and drums, whistles, and homemade percussion instruments. It took some time, though, to get used to 3 or 4 hour services with hour long announcements in Swahili or Chigogo. Singing, dancing, and drumming by the Msalato Girl’s School church choir was enthusiastic enough to make the building shake. And it was exceptionally high quality, too. 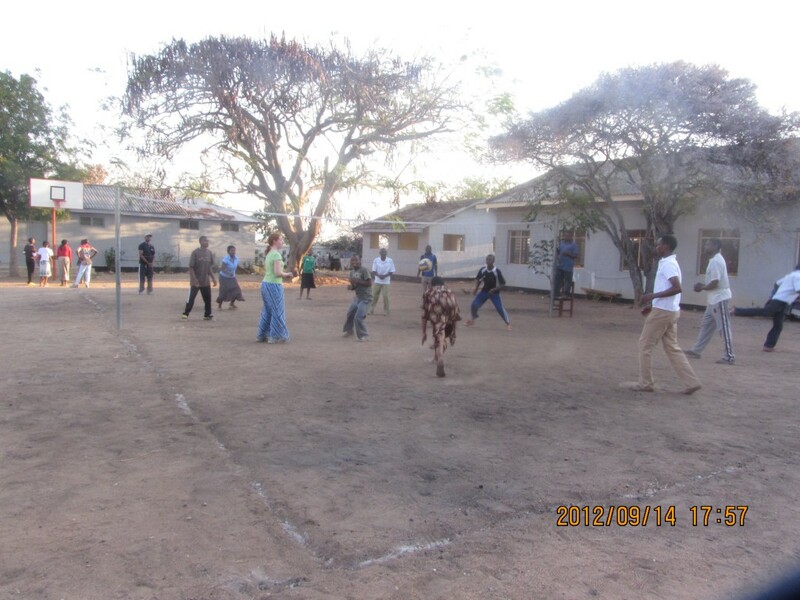 This is where Elizabeth’s group was assigned to lead a pastoral care group each Sunday. Zanzibar is home to Stonetown, a maze of narrow, winding streets, tall buildings, great views of the Indian ocean, and a distinctly Arab feel much different than the mainland. 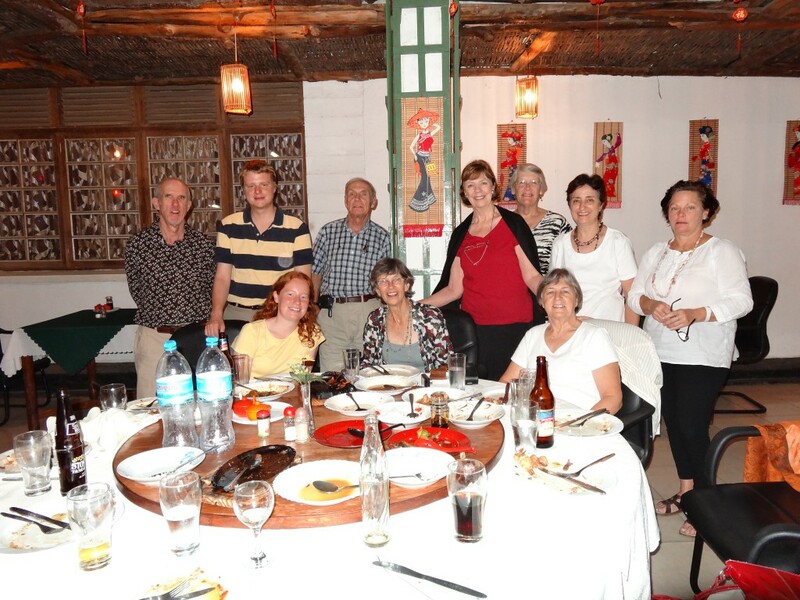 We spent two weeks there at Swahili language school, but we made sure also to take time and explore the island. Animals around Dodoma are just more colorful than here. We had read-headed, blue-bodied lizards, glowing red insects, and techni-colored birds on campus. Elizabeth’s parents also visited and traveled north with us to see lions, zebras, wildebeests, cheetahs, rhinos, leopards, and rhinoceroses. There is no electricity in the village, so there are few distractions preventing good, long conversations and lots of laughter. 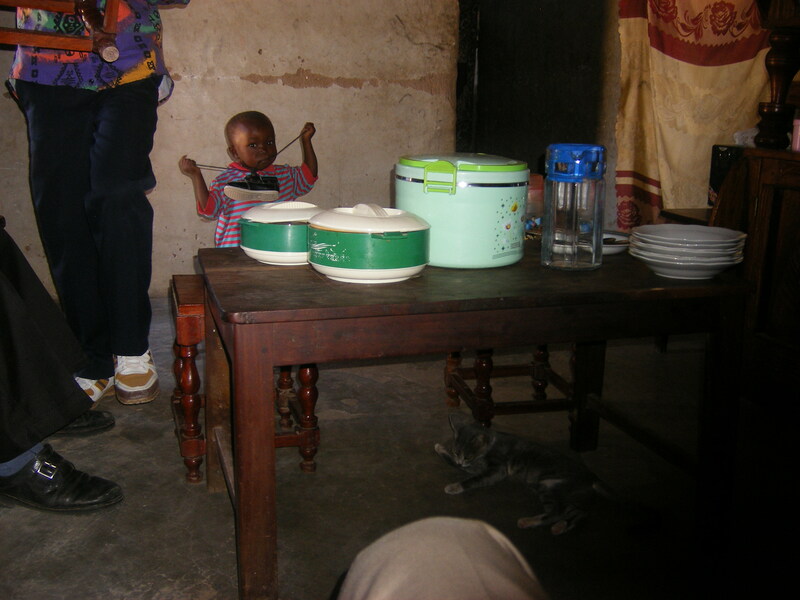 Long meals of ugali (cornmeal paste) or rice with beans or meat was the highlight of the day. 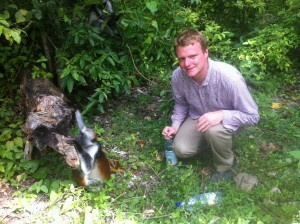 We had many occasions to visit villages, including a weekend-long trip with one of our theology students, Robert. 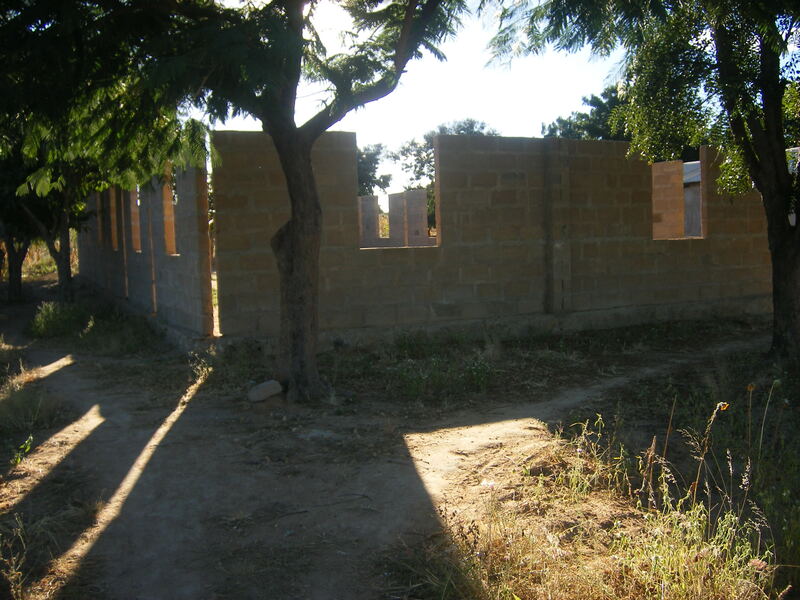 Our home for a year was always busy with students studying or playing football, teachers preparing lessons, and someone always singing. Ben’s domain was the computer rooms and Elizabeth’s was the library and classrooms. 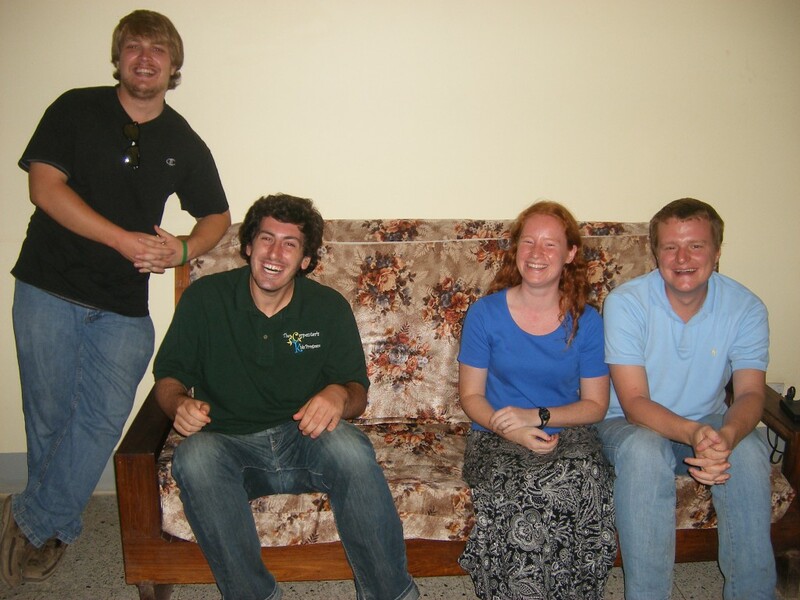 Some of our best friends in Dodoma were missionaries from around the world. England, New Zealand, Kenya, Canada, Australia and America were all represented by missionaries at Msalato (some of whom had passionate but good-neighbored rivalries re-fighting the War of 1812). We also had friends who were working for other organizations in the area, including Brian and Chris, both from New York state, who are pictured here. We will miss our students perhaps most. Elizabeth enjoyed regaling them with stories of the saints and sinners of Christian history, exploring scripture, and debating theology. Ben loved introducing them to computers — new territory for many of the students. 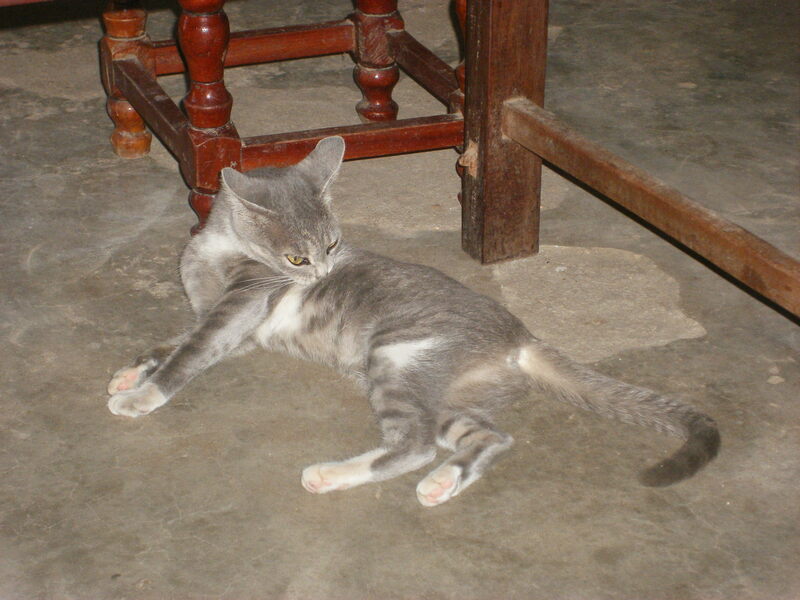 They were welcome in our house, and many became close friends. 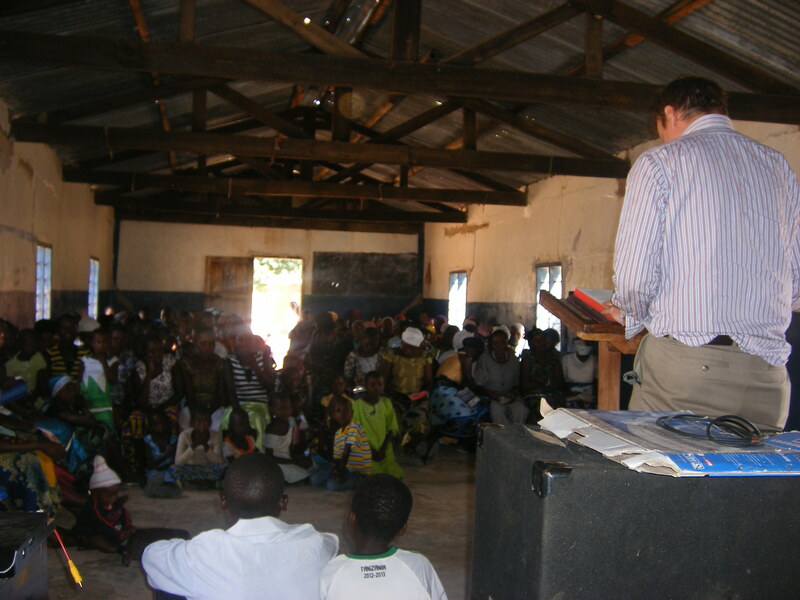 This is the first sermon I preached in Swahili. I preached it on Sunday, May 5, 2013, the Sixth Sunday of Easter, at the Msalato Girls’ School where I served as a chaplain. 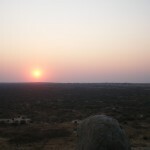 Last Sunday we spent the weekend at Chisichili village, about an hour southeast of Msalato. 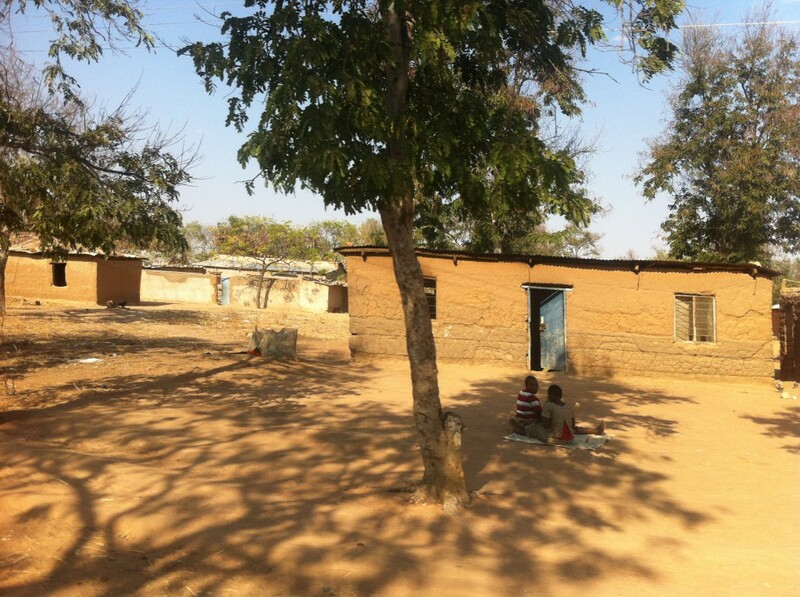 Chisichili village is the home of our friend Robert Jacob, a first year theology student who does gardening for us. 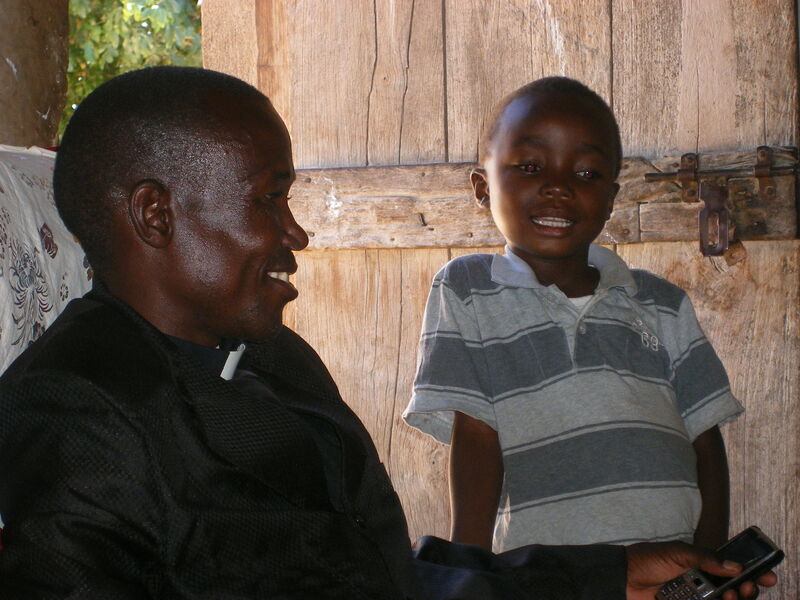 Robert’s father is the pastor of the parish, where he leads worship for three different congregations. 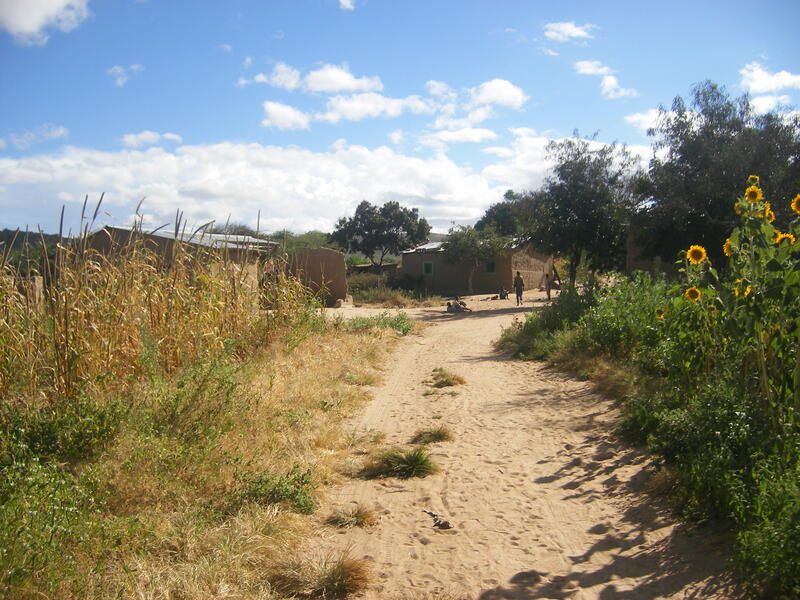 We travelled by dalladalla (local van/buses) and car to get to the village, and once we arrived we got a tour of the area. 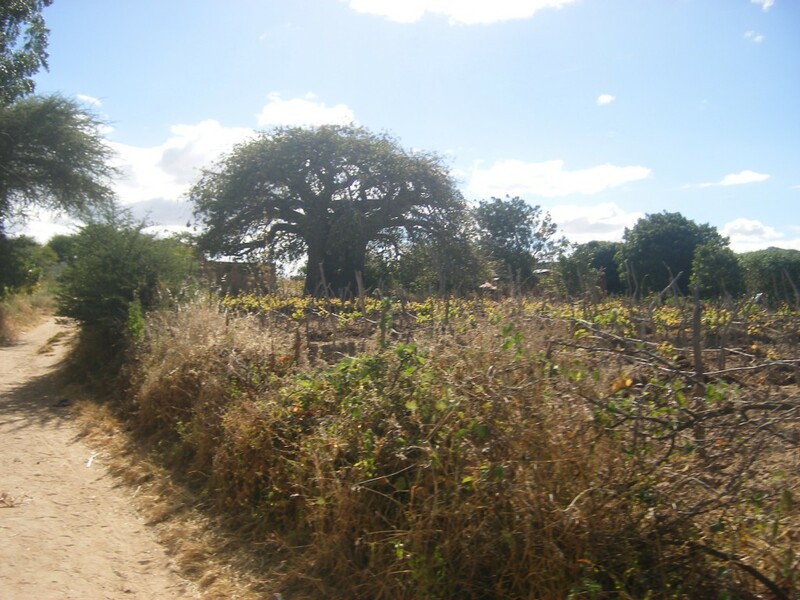 Chisichili village gets its name from the large Baobab tree that grows there. “Chisichili” in the Gogo language means the seeds that come from this tree. We saw the tree itself, and the crops, homes, and surrounding hilly countryside in this pretty area of the country. There are more pictures from our walk in the gallery at the bottom of the page! Robert’s family was very gracious in hosting us from our arrival on Saturday afternoon until our departure later the next day. 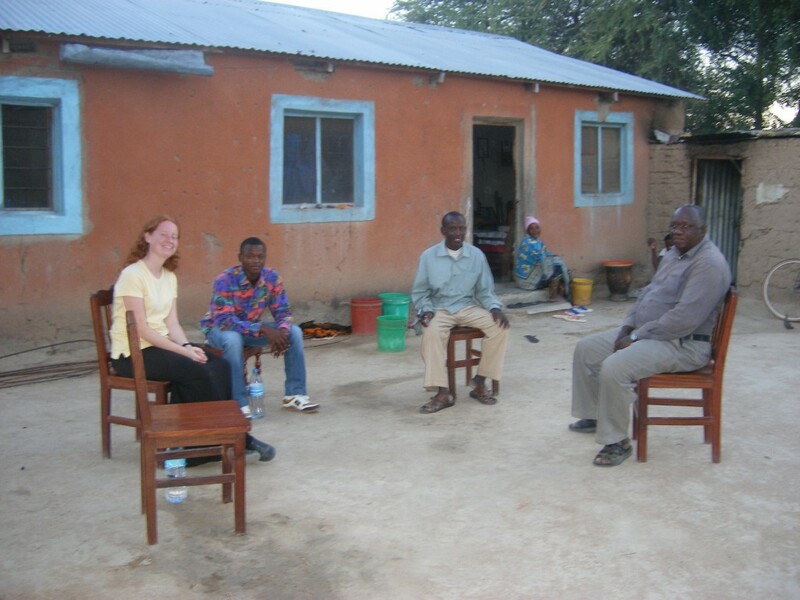 We spent the afternoon visiting with them, especially getting to know Robert’s father, who was a student at Msalato 10 years ago, and the parish catechist, the family’s next door neighbor and close friend. Cooking over a single charcoal burner (called a jiko) is a time consuming activity, and so we had a lot of time while dinner was being prepared to watch the local children playing around the church, and see some of the older children doing their choir rehearsal. It was full dark by the time we had dinner, and it’s just past the new moon, so the stars were incredible! We ate dinner by the light of a battery powered electric lantern. 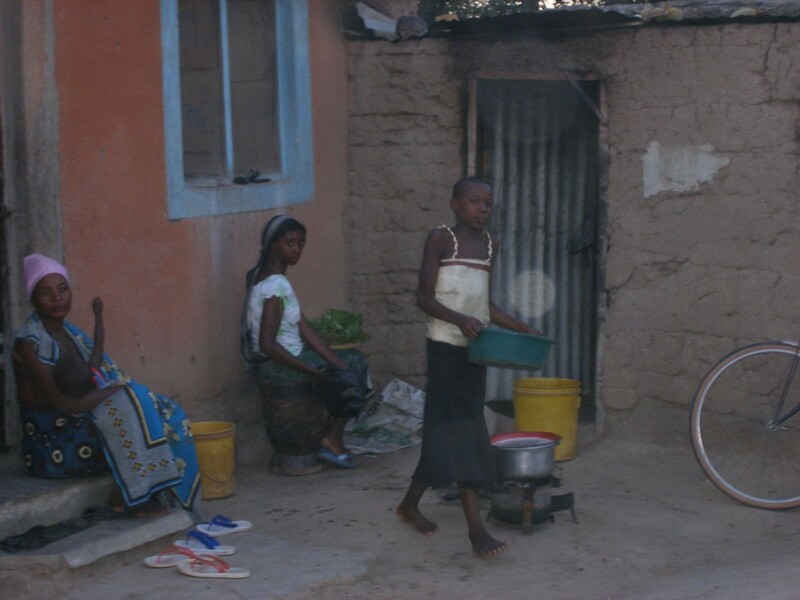 Without much electricity, bedtime is early in the village – usually around 9pm. The service was very lively and energetic, with lots of singing and excellent dancing from three different choirs. It was a great trip and we are so grateful to Robert and his family for welcoming us. It was our first time to spend the night in a village, and it really allowed us to see and experience more of village life than you get from a busy Sunday morning church visit. We were thrilled to make new friends and meet more of our brothers and sisters in Christ. We have just recently passed the 6 month mark since our arrival in Dodoma, Tanzania, and it has been a really incredible time so far. Although we have moved from one nation’s capital to another, it has been a big shift. 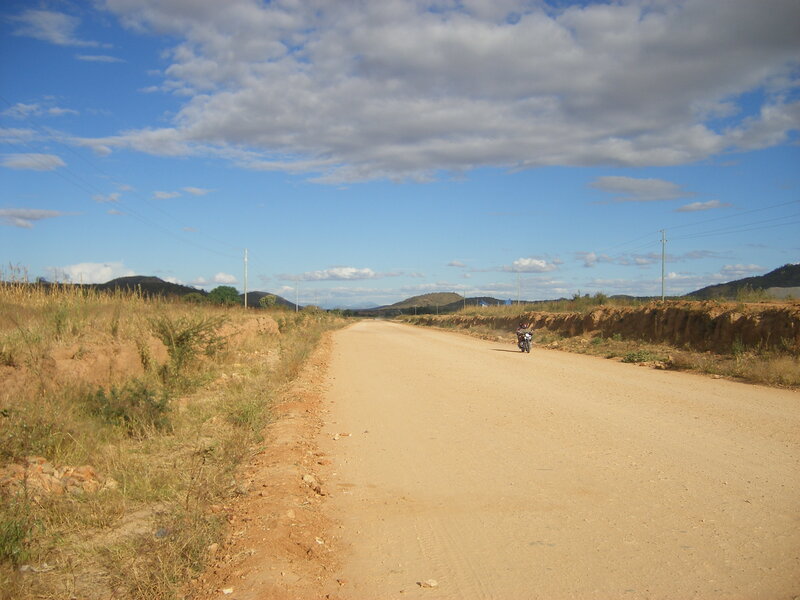 Dodoma is a small city, and though it has a couple traffic circles to help us feel at home, there aren’t even any stoplights. 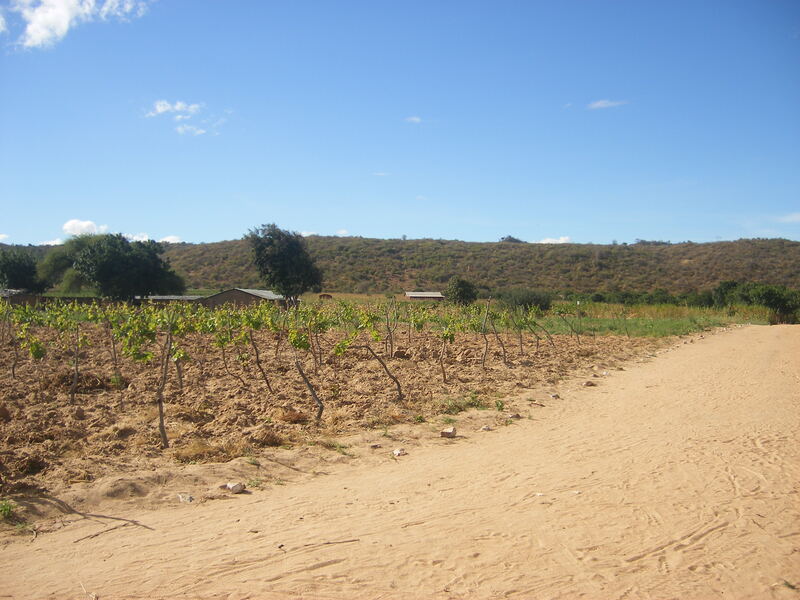 The seminary we live is well outside of town – several kilometers past where the paved road ends. It’s rural out here, and our next-door neighbors have roosters to help us wake up each morning. We even had to chase a cow out of our yard about a week after we arrived! 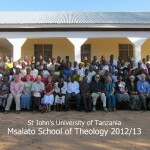 Working with the students here at Msalato Theological College has been great. 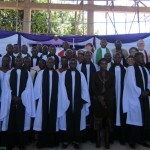 We have 46 students in the diploma program, most of whom are preparing to serve as priests in parishes in this region. 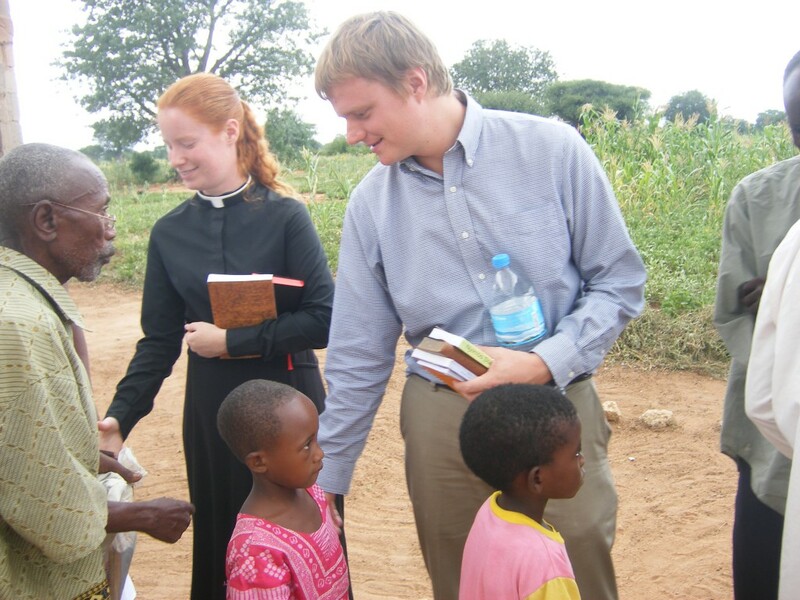 In addition, we have eight students pursuing bachelor’s degrees, who generally are preparing to teach theology here in the Diocese of Central Tanganyika or in other dioceses throughout the country. There are also programs for students and some wives of students to study English, and a secretarial program. We spend time with all of these students, whether teaching them in class, worshiping with them at our daily chapel services, or traveling with them to lead worship at local parishes. 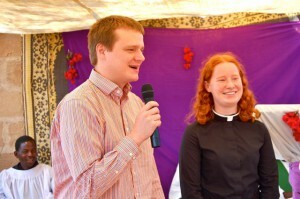 Benjamin and Elizabeth Locher introduce themselves during a worship service at a local village, Mvumi Mkulu. 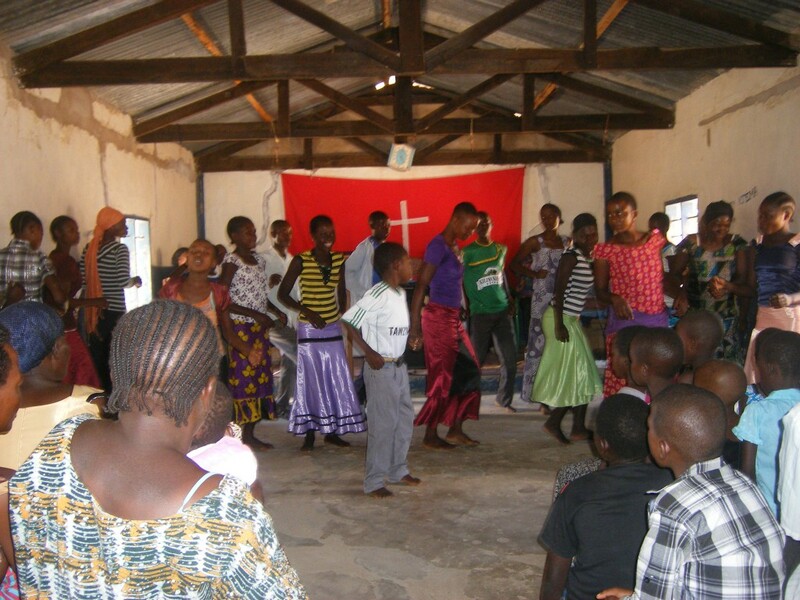 The service was filled with lively song and dance. 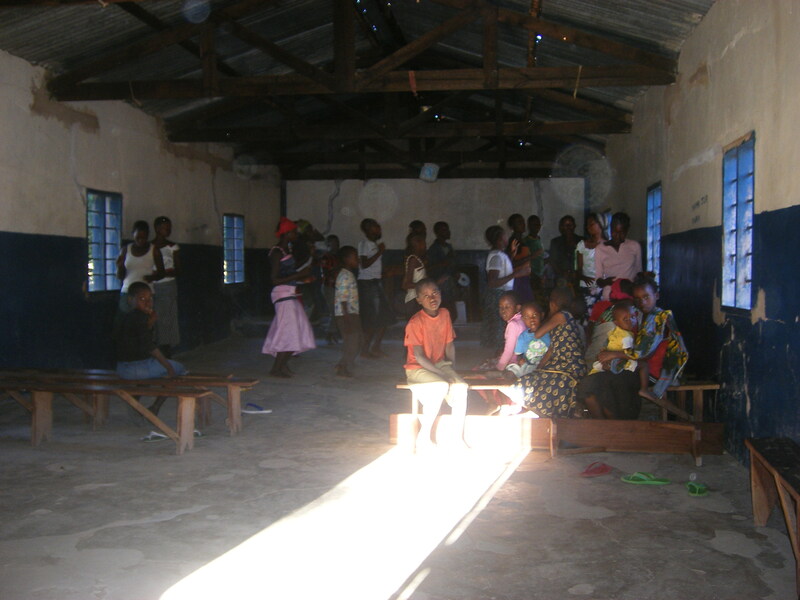 Each teacher and each student at Msalato is assigned to a pastoral care group. 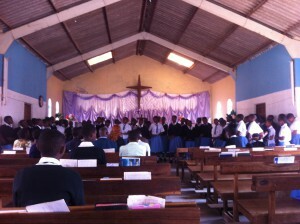 These groups meet every Wednesday morning to sing, study Scripture, and pray for each other. These same groups go out each Sunday to lead worship at local parishes, in this seminary’s version of seminarian internships. 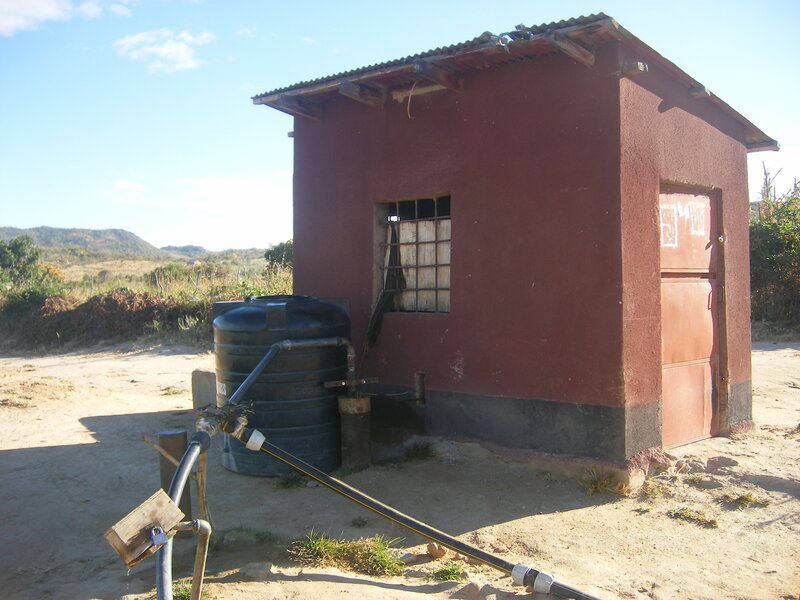 Ben’s group serves a nearby parish, and Elizabeth’s works with the girls’ high school next to Msalato’s campus. 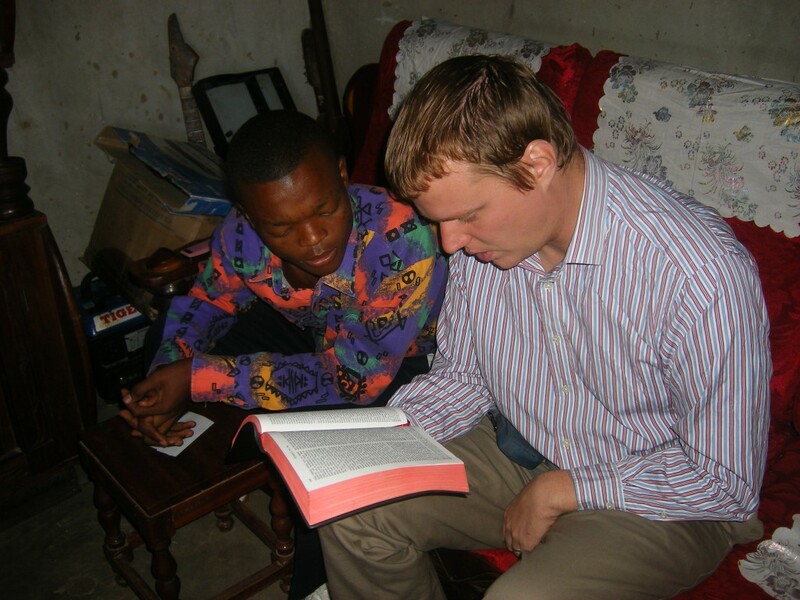 Teachers mentor and train the students, who do most of the work of preaching and leading services. It is a great joy to work with all these students preparing for ministry, to see their enthusiasm and passion for Christ, to watch them grow in skill and confidence at leading worship, and to have the great blessing of worshiping Christ with His family in this region of the world. One of our favorite songs is “Katika Jesu tu familia moja” which means “In Jesus Christ we are one family”. This song is always sung as a recessional, and after the leaders recess, each member of the parish follows them out the doors and makes a huge circle in front of the church, shaking hands with every single person on their way around the circle. It is an incredible thing to sing such a song and shake hands with everyone, from toddlers to grandmothers, some of whom don’t speak a word of English, but all of whom are singing about the deepest bond of brotherhood in the world: being part of the family of Christ. 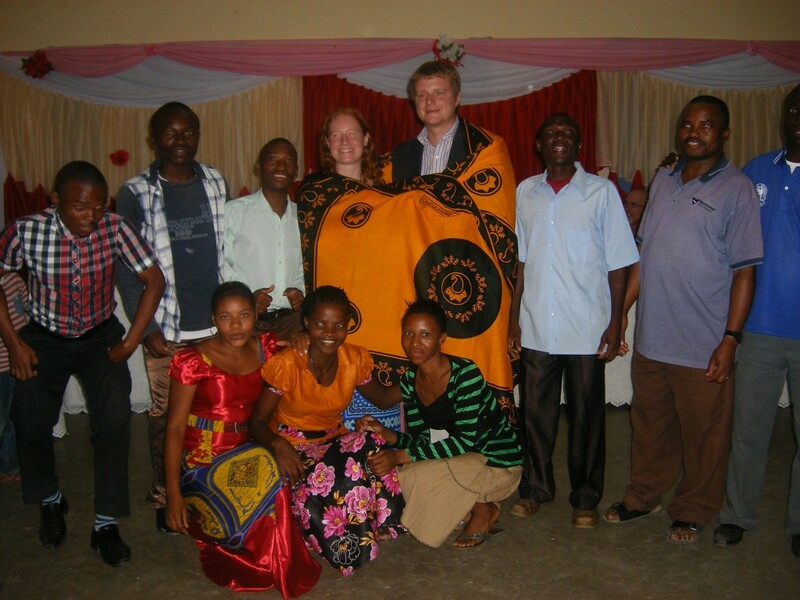 The two of us each have our particular work and ministry here at Msalato, and we wanted to share our personal reflections on our life and service in Tanzania. Last semester I taught first year degree and diploma theology students basic computer skills. 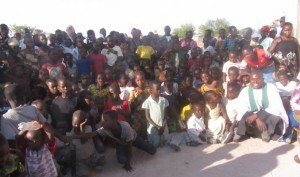 Many of the students at Msalato arrived having never used a computer. Some did not even have electricity in their homes to run a computer. Soon after arriving, the students were presented with the daunting task of producing a well-typed, properly footnoted paper. So, it was quite a challenge that I was presented with on the first day of class, but it was exciting to watch the students progress through the semester. In the beginning, we started with such basics as how to turn on a computer, but by the end of the semester every student was able to give a PowerPoint presentation on an important saint of the church. This semester, I am also teaching the “Computer Applications” course for the secretarial students. 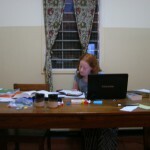 This course covers some of the same material as the theology computer course, but at greater depth. In addition to word processing and PowerPoint, I will be teaching spreadsheets, relational databases, and desktop publishing. One recent graduate of the secretary program, Elias Malesa, recently received a job working with databases. Since then, I have been working with him one-on-one teaching him how to design a database. He gets quite a thrill when the computer can produce results on his command. This has been some of the most rewarding work I have done! 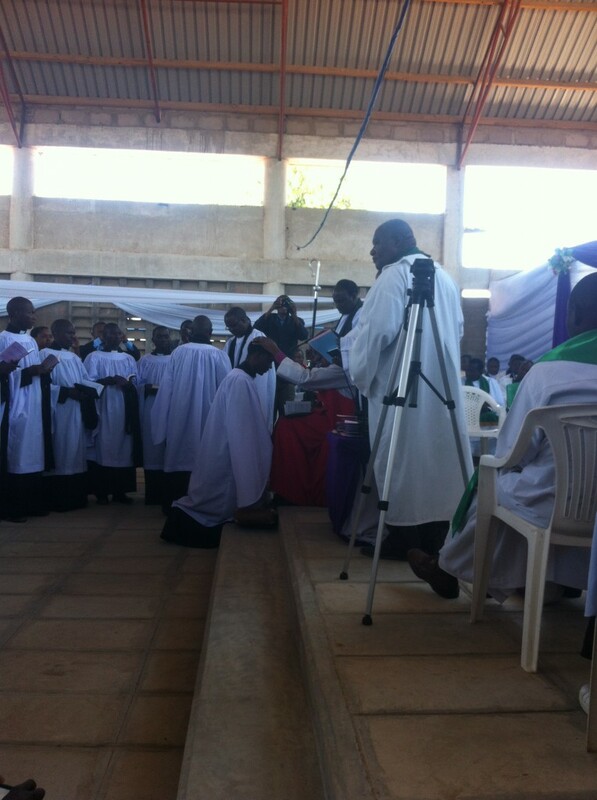 Parishioners line up to shake hands after a service at Mtakatifu Petro parish while the Mamas' choir performs. This is where Benjamin is assigned to serve on Sundays. The rest of my time is spent trying to rescue broken computers from failed hard drives, thumb-drive borne viruses, and a host of other problems. While Msalato is fortunate to have three fairly well-stocked computer labs on campus, much of the equipment is aging, so there are enough problems to keep one busy. Our students who are in the degree track (generally people who want to teach at another seminary or university) are given a donated, old laptop computer which they will be able to take with them after graduation to use in their work. I spend a large part of my time rescuing these machines, the oldest of which is more than 12 years old. As an aside, if you are thinking of getting rid of an old (or new!) laptop, we can always use one! Though my work is largely ancillary to the goal of theological education, I am very much involved in communal life of worship. I was invited to preach recently, and you can find my sermon on the power of the Devil (and the much greater power of God) on our blog. 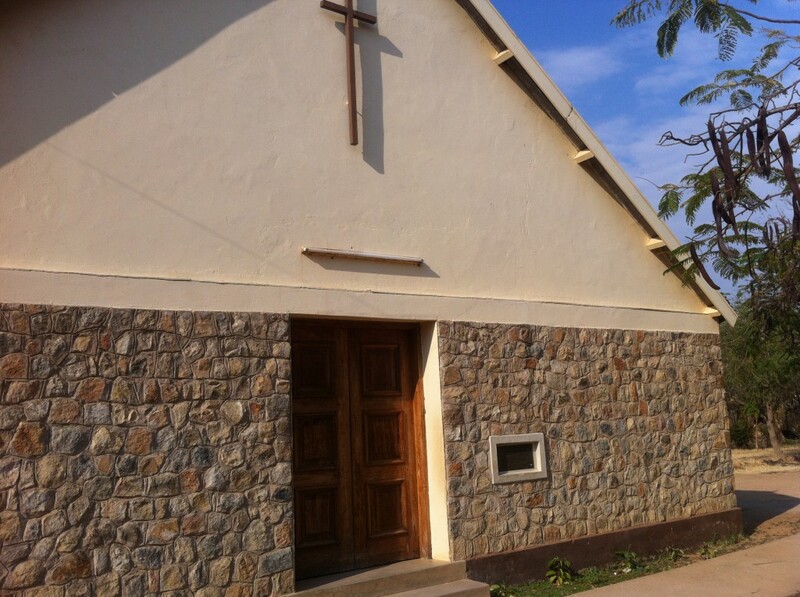 Additionally, I, along with one other teacher, lead a pastoral care group which is assigned a local parish, Mtakatifu Petro (Saint Peter) also known as Muungano, about a 40 minute walk from campus. 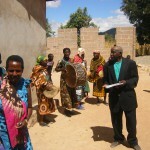 Worship in Tanzania generally and Muungano particularly is very lively. 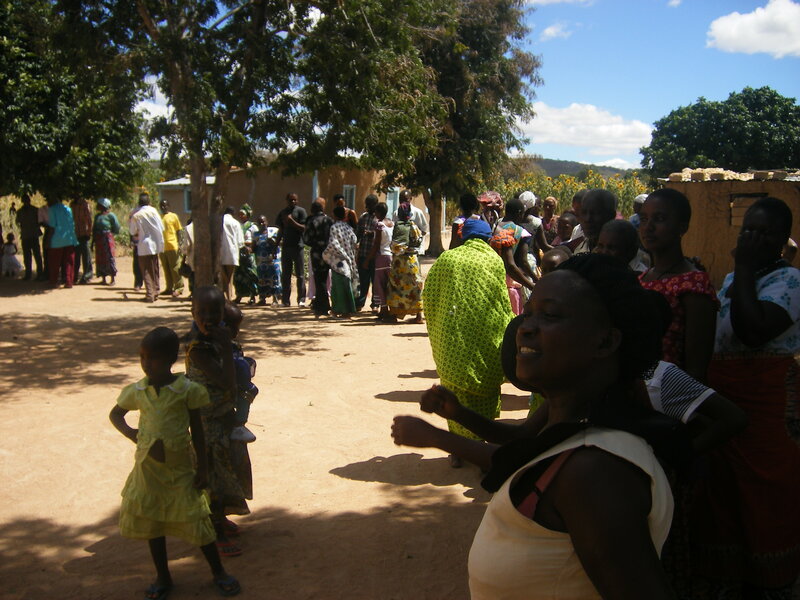 It involves animated sermons in Swahili and music and dance from three choirs, the Mama’s choir (which sings traditional music in the tribal language Chigogo), the main choir (which uses a synthesizer and sings in Swahili), and a children’ choir. It has been an interesting experience teaching at a seminary so soon after graduating from seminary myself. I feel like my students and I share a certain freshness and excitement about our future ministries, and I also share a deep empathy with them when they have lots of studying to do or essays to write. The tables have turned, and I have also come to a much deeper appreciation for how hard teachers work! 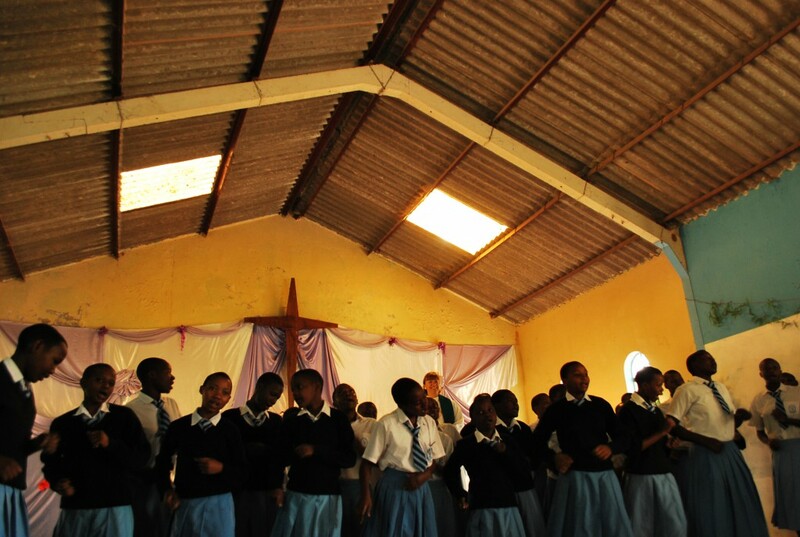 The students at Msalato Seconday School sing and dance before a worship service. 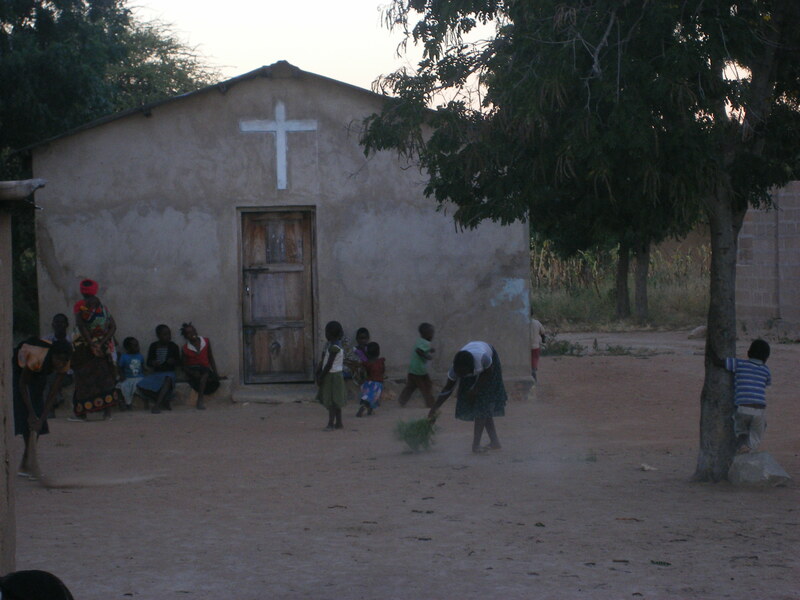 Msalato Secondary School is where Elizabeth is assigned to serve on Sundays. Last term I taught Church History, New Testament, and Christian Doctrine, and this term I am continuing on with the second half of the New Testament and two classes on the history of the Reformation. I really loved teaching theology last term – it was such an incredible privilege to meet with my students to contemplate the mystery of God. They were full of all sorts of questions, and together we would explore Scripture and discover how the Christian theologians who came before us had done so much to help us understand how the Christian account of the world fits together. And we would laugh as we realized that, as much as we tried to learn, God would continue to be infinitely more vast and mysterious than we could imagine. I have also found Church History to be a particular joy to teach. I love telling stories, and there are so many amazing stories in the history of the Church. So many of these stories were completely new to my students, and so for me the familiar stories of martyrs and popes and villains and saints gained a fresh power as I told them to people who were hearing them for the first time. My students and I have found so much joy in learning about the Church as it stretches all across the world and across time, and we rejoice that we, too, are part of this incredible story. 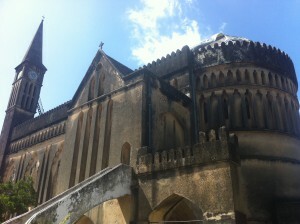 Ben and Elizabeth worshiped at Christ Church Cathedral, Zanzibar, while studying Swahili. When classes ended for the Christmas break, the two of us had the opportunity to go to language school to improve our Swahili, and we were lucky enough to find a Swahili school in Zanzibar. 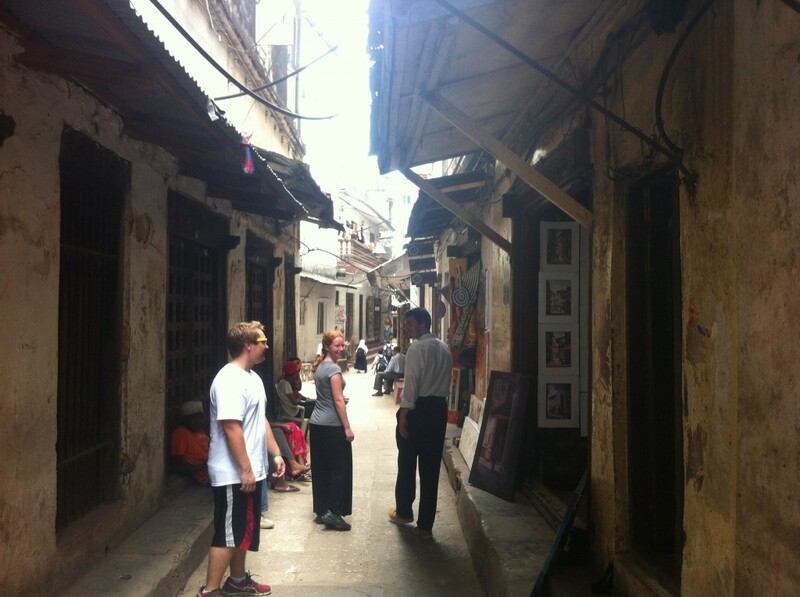 We spent two weeks living in Stonetown, cramming our brains full of grammar and vocabulary, and also exploring the city. 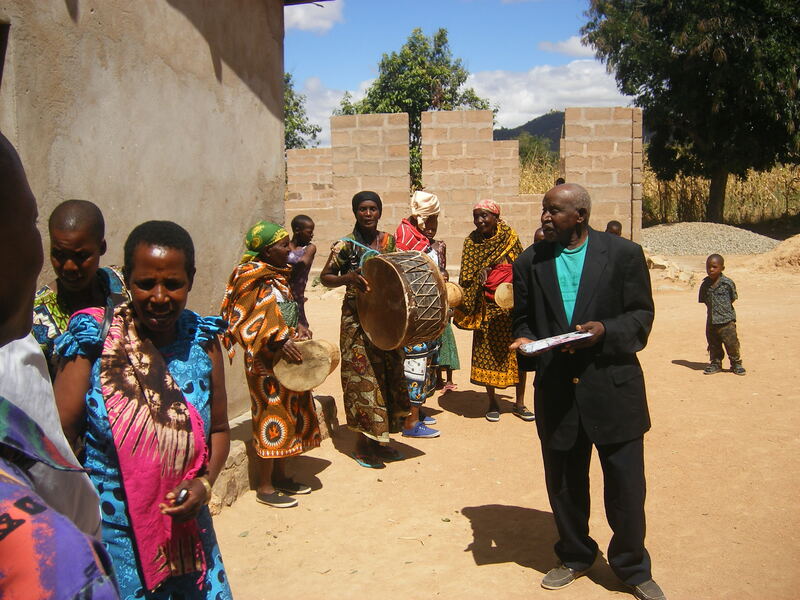 We aren’t quite fluent yet, but we have gotten better at basic conversation and at following along in Swahili-language church services! Now we are back in Dodoma, and excited for our new term. We are thinking of you all, and praying for you. Please continue to pray for us as we continue our mission to grow deeper bonds of love between Christians across the world. Here at Msalato, we include a short sermon at Morning Prayer on Monday and Fridays — no longer than four minutes. Here is my first attempt at a sermon. May I speak to you in the Name of the One, True, and Living God – Father, Son, and Holy Spirit. Demons are real. They are intelligent. They are determined. And they want nothing more than to separate you and me from the Love that is God. In today’s reading from Ephesians, Paul urges us to take a firm stand against the Devil’s schemes (6:11) and to fight against the spiritual forces (that is, the demons) of the heavenly realms (6:12). The gospel accounts tell us that as soon as Jesus was baptized and the Father proclaimed him his beloved child, Jesus was immediately led into the wilderness to be tempted by the devil. Likewise, in our baptism, the Father adopts us as his children. And like Christ, we are tempted by the Devil. Life in Christ here on Earth includes a constant struggle against the Devil and his temptations. So what are the devil’s schemes? 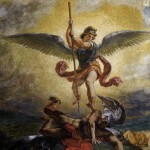 Sometimes the devil (or another demon) will strike in a dramatic way (look for instance at the many demoniacs who have become violently possessed), but more often he tempts us each to small sins that slowly draw us one by one farther away from God. A demon will often use our Godly actions and turn them around. He may use our pious prayers to lead us to pride and smugness. He may use our well-meaning convictions to lead us into divisive factions. When we go to church to praise God, he may lead us to anger at the person who is making noise beside us. If we work hard one semester, he may plant the idea that it is acceptable to neglect our school work or cheat to make it easier the next semester. Demons know us well, and they will attack us at our weakest points. How are you most tempted? Despite this, the Christian Gospel is in fact “Good News” – and here is that good news. Our God, the creator of all that exists, is more powerful – way more powerful – than Satan and all his fallen angels. We sometimes talk about God and Satan as being opposites, equal forces fighting a battle of good and evil. But this a dangerous heresy. Nothing that has been, is, or will be exists apart from God. God the creator is far more powerful than all creatures including the fallen angels. And our God sent his only son to die a perfect sacrifice for us that we might be saved from sin, death, and the Devil. God equips us with the armor we need to resist the temptations of the devil. So as we are assaulted day in and day out by the temptations of the devil, we can put on the shield of faith, which no arrow can pierce. In our baptism, we are born anew and made children of God. As Paul said to the Romans, Now if we are children, then we are heirs–heirs of God and co-heirs with Christ, if indeed we share in his sufferings in order that we may also share in his glory. When the Church reformer, Martin Luther, was tempted by the devil, he would shout, “I AM BAPTIZED.” That is, baptized into the death and resurrection of Christ of God. Against that, the devil cannot possibly win. I thought I would describe some of the adventures we have had over here with local animals. 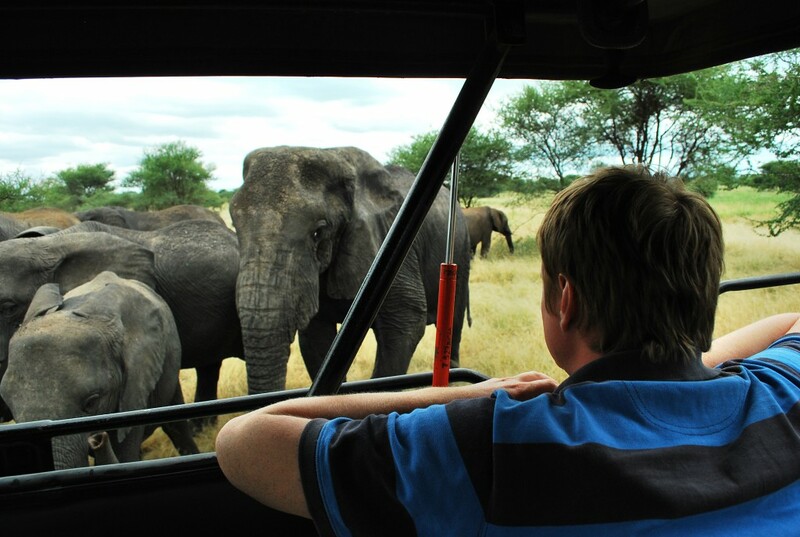 We saw all sorts of animals during the last month while we were travelling in South Africa and Zanzibar, but we’ve had plenty of interesting encounters here in Dodoma, as well. From the first day we arrived in our new house, we discovered that we had roommates. We met a little lizard whom we have named “Steve”. It turns out that Steve has a lot of family members, all also named Steve (or “Baby Steve” if they are very miniature). 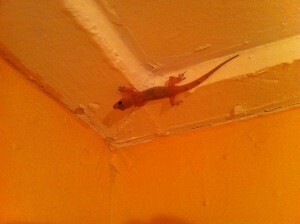 I love our lizard roommates, and I really love that they eat mosquitos! 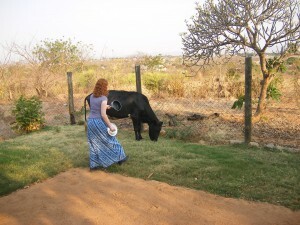 Also within the first month or so, we had an unexpected visit from a next-door neighbor – a cow! We have this lovely, welcoming grass inside our fence, and so a local cow wandered all the way around our fence until she found the way in. It was a lot harder to help her find the way back out again. My attempt at banging pots and pans was not enough to deter her from her delicious meal. Eventually a student helped us chase her out with a mop. Other animal guests have included birds and bats in our roof, lots of insects, and even a neighbor’s goat, who spent an afternoon tied to our tree. 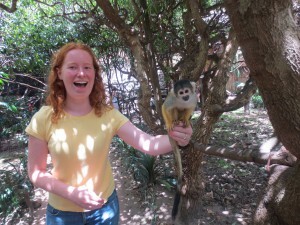 Then during our recent travels we had two opportunities to hang out with monkeys – once with squirrel monkeys in South Africa, and once with red and blue colubus monkeys in the forest in Zanzibar. In South Africa the monkeys were in a zoo, but it was an interactive exhibit. As you can see, I was very excited! On our way to stay with friends in Grahamstown, South Africa, the highway was bordered by several game reserves, and so we saw springbok, wildebeest, and even zebras! 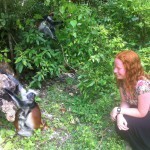 But perhaps my favorite surprise animal encounter was on Christmas day, just east of the southern point of Africa. It was a beautiful day and we were spending it at the beach. It was really lovely, but I confess I was feeling a little sad because it didn’t feel quite “Christmas-y” to me. But suddenly as I sat there, a pod of dolphins swam into the bay and began jumping and splashing around. Awesome! So no white Christmas, but I got a dolphin Christmas instead. That was a pretty excellent gift! It has been my joy and my privilege this term to teach Church history for the first time. I have a great love for Church history because I have a great love of stories, and the story of the Church and of the spread of the Gospel to every corner of the earth is one of the great stories of this world. But what has really been touching me as I teach this term about the big story of the Church, is all the small stories that are pieces of the Church’s history. Even if you have not studied Church history, many of these stories are known to you from Scripture – Jesus’ call to Simon Peter – “Come, follow me.” The conversion of Paul, who had once been an enemy of the Church. The death of Stephen, the first of Christ’s followers to die for his faith, whose own death followed the pattern of our Lord Jesus’ death. When Stephen was dying, he said, “Lord, receive my Spirit” and then prayed for God to forgive the people who were killing him, as Jesus did. 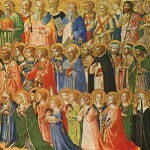 On this day, the feast of All Saints, we give thanks and praise to God for these holy Christians, these friends of God. We give thanks that their stories can help us find the courage and the strength to try to follow God as faithfully as they did. We give thanks because these faithful and holy people can be like windows – so that we can look through them and see the light, and glory, and holiness of God that shines through their lives and their stories. And I think we can even give thanks to God for the sinful and dark parts of their stories, like Peter denying Jesus 3 times, or Paul encouraging the crowd to kill Stephen, because these parts of the stories teach us that even when we find ourselves caught in our own darkness and sin, there is always hope for forgiveness, and redemption, and friendship with God again for us. And also we can give thanks, on this Feast of All Saints, that no person’s story is too small to be part of the story of the Church. In the book of Ecclesiasticus today we heard how “there are some who have no memorial” – who have died without us knowing the story of how they lived. “But,” Scripture tells us, “these were merciful people, whose righteous deeds have not been forgotten.” They have not been forgotten by God. They have not been forgotten by those Christians and others who knew and loved them and saw in them some of the love and holiness we find in Jesus Christ, who claims them as his friends. And we can learn from these holy people – these saints who are well known and the saints whom almost no one living remembers, that each one of our stories is known to God, and we are not too sinful, or too small, or too unknown to be God’s friends, or to serve Him and love Him. And we are not too sinful, or too small, or too unknown to help other people – to show the holiness of God in our own lives. We too can help our families, our friends, or our neighbours to also become friends of God. 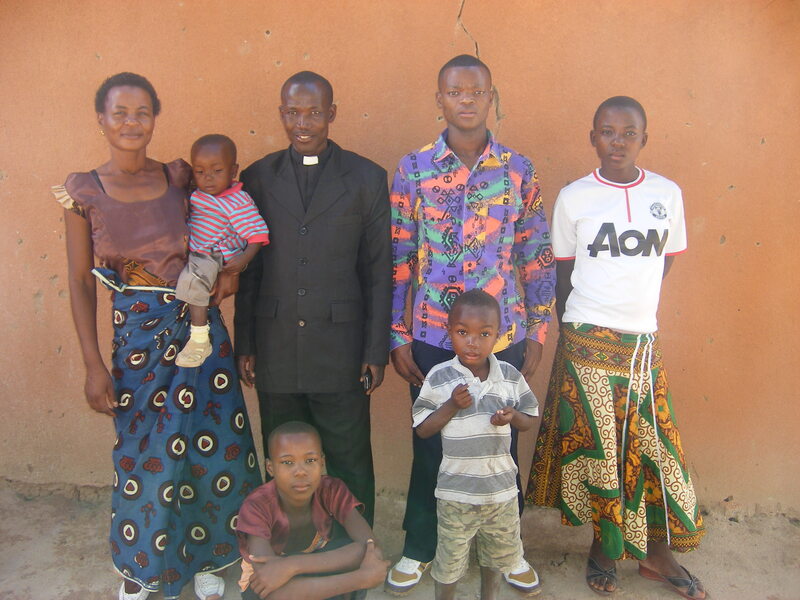 When Father Peter Fumbi graduated from Msalato Theological College last year, he immediately set out to spread the good news of Jesus Christ. He did such a good job that he came back (just four months later) to ask for help baptizing the multitudes that had flocked to his church. He said there were a few dozen waiting to be baptized. 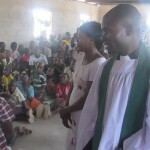 Three priests and deacons who teach at Msalato set out for Peter’s village. When they arrived, there were actually 240 people in three different locations – adults and children — waiting to receive the waters of baptism. So much water was splashed around that servers had to continually mop the floor. Though we couldn’t be there, I imagine the scene was a lot like the mass baptisms recorded in the Book of Acts – where many felt compelled to receive new life with Jesus Christ. 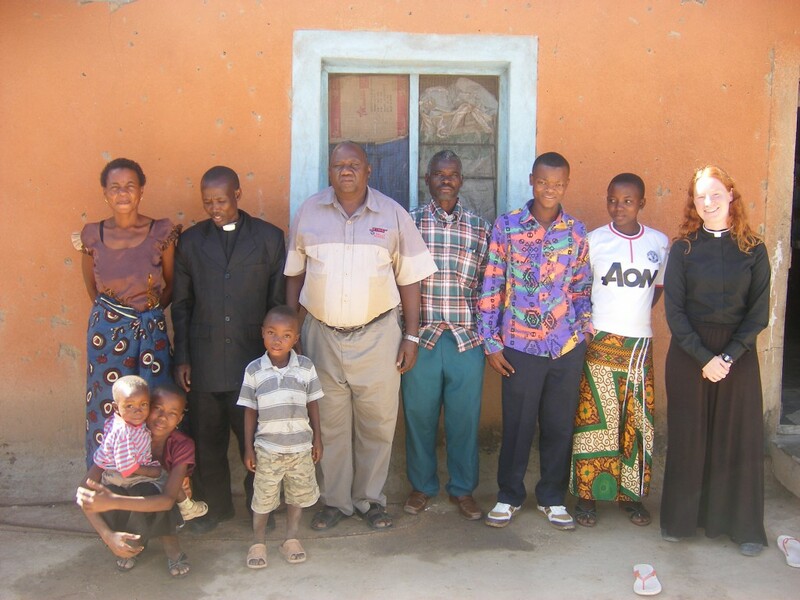 Soon after the baptism, we, along with 50 other missionaries, met with Bishop Mdimi Mhogolo, the bishop of Central Tanganyika, for a bible study on baptism. 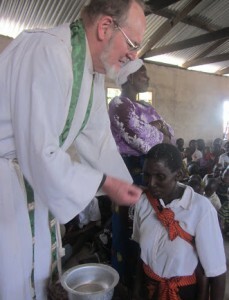 He reflected that baptism was the one tangible, visible sign that marks each of us as Christians — from Tanzania or from halfway around the world in the United States. Baptism, no matter who we are or where we live, is a participation in the death and resurrection of Jesus Christ. Whether we like it or not, we are also in relationship with all the others who have been baptized, not just in this world and in this life, but with all those countless millions who have gone before us in the life of Faith; “here they all come”- and what a motley crew of saints and sinners they and we are. We don’t choose our supernatural families any more than we choose our natural family. They are a given if we are in Christ, we are members one of another, “the whole company of heaven”, and we are deeply bound to one another in this world and the next because we are sealed and claimed as Christ’s own. As I have often said, “no Christian soul ever stands alone”. That family – our family – has many new members today from around the world. 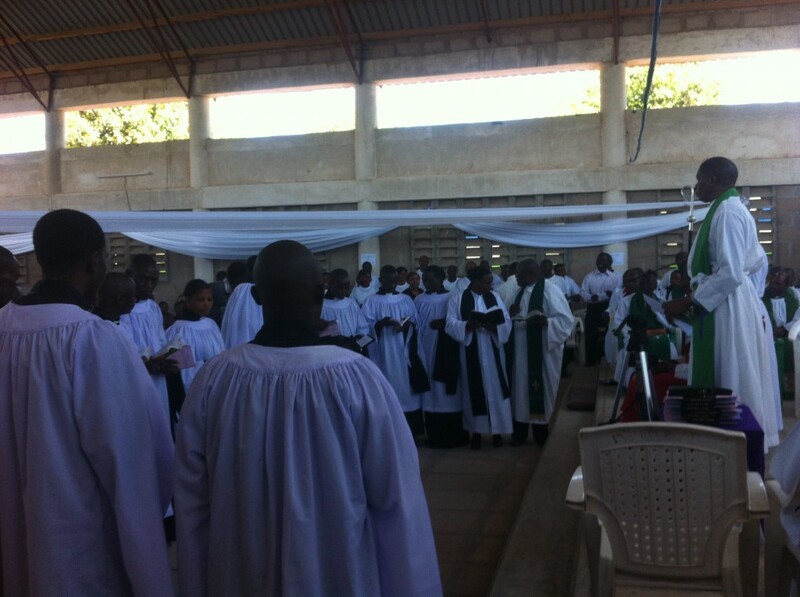 This last Sunday we saw 14 new deacons ordained for the Diocese of Central Tanganyika. 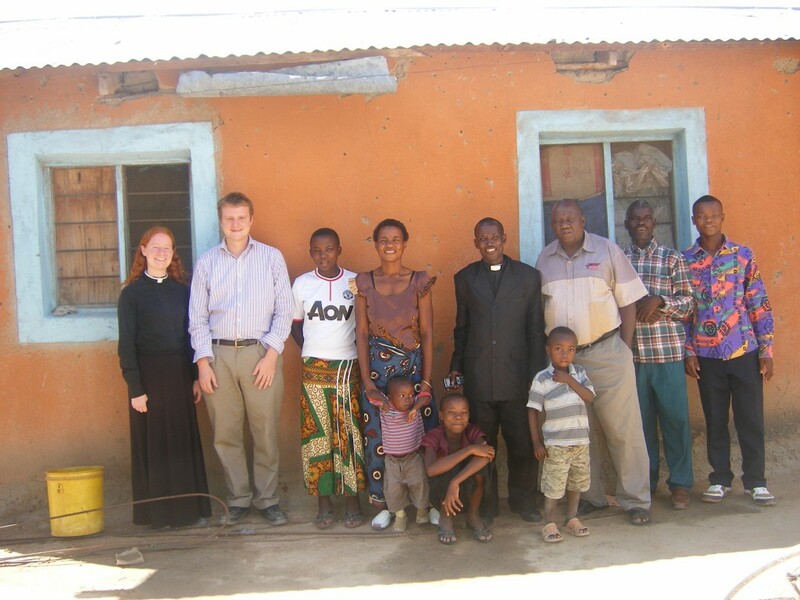 It was a very exciting day, and it was particularly exciting that I knew one of the ordinands, Revocatus, who had come to visit VTS last January with other Msalato students. Each of these new deacons will be sent out to serve villages in the diocese. Many have been assigned to villages that are hours away from their hometowns, and I believe they each will be the sole clergyperson in the parish they serve. I have been reflecting on what a remarkable sacrifice it is for each of them, and for each of my students here at school, to offer themselves for Holy Orders. They do not have the luxury many American seminarians have of getting to select the parish they would like to serve. And I know a priest here who was sent to his first parish and found that there was no house for him and his family to live in. I admire the courage of each person here who has responded to a sense of God’s call. This evening I was talking to a student about a sermon he will preach next week. The passage is the Call of Jeremiah – Jeremiah 1:1-10. It is a fantastic text! And I think it offers words of comfort and words of challenge to each one of us, whether we are in seminary or not, whether we are far from home or in a comfortable place. “Do not be afraid,” the Lord says, “for I am with you.” But we are also warned that God knew each of us in the womb, and consecrated each of us for some particular service and mission. Even if we don’t all hear a call quite as clearly as the prophet Jeremiah, I believe God puts a call, and a love and a yearning, inside each one of us. One of the great tasks of our lives is puzzling out that mysterious call and learning what incredible plans the Lord has for us, and then finding the courage to follow Him. I must start this post with a confession. Despite the 20 years I have spent in school, I truly never realized just how much work it is to be a teacher. But to all my former teachers and all my friends who teach: it’s finally sinking in. Thank you for all the amazing work that you do. It has now been two weeks since I taught my first class at the seminary here. I am teaching three subjects this term: New Testament I (the gospels and Acts), Church History I (500BC to 1500AD) and Introduction to Christian Doctrine (everything). I live with a constant worry that I will just run out of things to say halfway through a class. But it seems that generally the opposite is true – when the class period ends I still have lots more I wanted to say. Those who spend a lot of time listening to me talk may perhaps be less surprised by this revelation than I have been. A lot of my learning has been figuring out how much information it is reasonable to try to cover in one lesson. And then trying to guess how much time my enthusiastic students will want to spend asking questions! Theology is the class I was most nervous about. Trying to speak in a comprehensible way about God is, to say the least, challenging. And trying to discuss the finer points of Trinitarian theology is generally baffling in anyone’s first language – but my students are studying it in their third. Yet for all that, theology is probably my favorite class right now. I organize my lesson plans around a bunch of questions, and then my students and I explore those questions together. I was a little nervous that my students might think this subject was rather abstract and less practical than some of their other subjects. But that has been the opposite of my experience. I had thought I would need to convince my students that these questions are important – because they help us to know God more and love Him more, because they help us to live our lives closer to the way God wants us to live, and because our parishioners are asking these questions in their own hearts. But I don’t have to convince them. My students are full of questions, and burning with curiosity about God, and excited to dive into Scripture to help them discover answers. (Or at least the hints of answers!) We question and explore and laugh and puzzle our way through together. Preparing for all my classes has been demanding, but amazing fruitful. Theology class is probably the hardest subject for me to prepare for, but once I walk into the classroom, I find that it is a place of particular joy and holiness.